Here’s a messy little passage from Blaise Pascal’s Pensées. 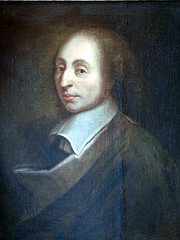 Pascal was a 17th century Frenchman who made major contributions to mathematics, physics, philosophy and theology, and indeed knew quite a bit about everything. Since we cannot be universal and know all that is to be known of everything, we ought to know a little about everything. For it is far better to know something about everything than to know all about one thing. Good God. What’s the shape of his reasoning?